(A Bunker Hill movie in a San Francisco blog? CitySleuth explains why). As the early morning light heralds a new day Homer and friends return from their all-nighter on Hill 'X' to his place on Clay Street, described here in an earlier post. Then ... They enter Clay from 2nd Street (crossing behind them), the men still sharing a bottle. 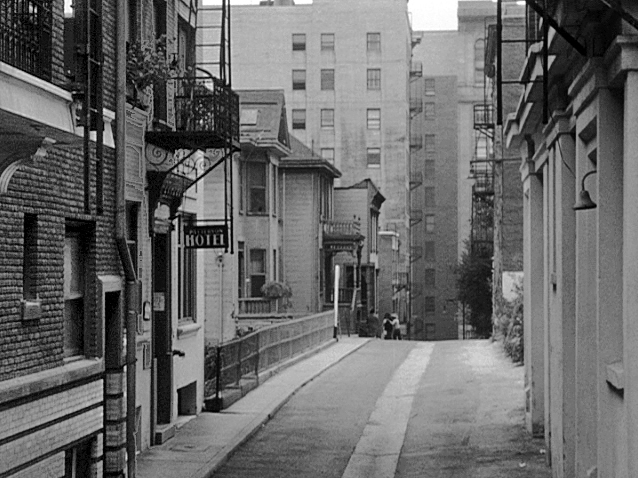 ... a vintage photo ... in this 1950s photo taken from Hill Street we see where Clay began, tee-ing in at the far left above the 2nd Street tunnel. and Now ... the Bunker Hill redevelopment project wiped Clay Street and all of those buildings above from the map. Below, the upper section of the parking structure at left and the open space in front of the residential highrise encroach on where Clay used to be but the tunnel was spared, albeit without the fine masonry balustrade - it was replaced by nondescript chain link. Then ... They walk along Clay towards 3rd Street passing the Sunshine Apartments perched on the retaining wall on the right. Homer spreads his Indian blanket while Tommy, always the ladies man, needs a little support to aid his equilibrium. In front of them they cross over the 3rd street tunnel where the tracks of the Angel's Flight funicular pass overhead. ... in 1948 ... a vintage photo captured the same view ten years earlier as Angel Flight's two rail cars change places on their short one block trip between Hill and Olive. 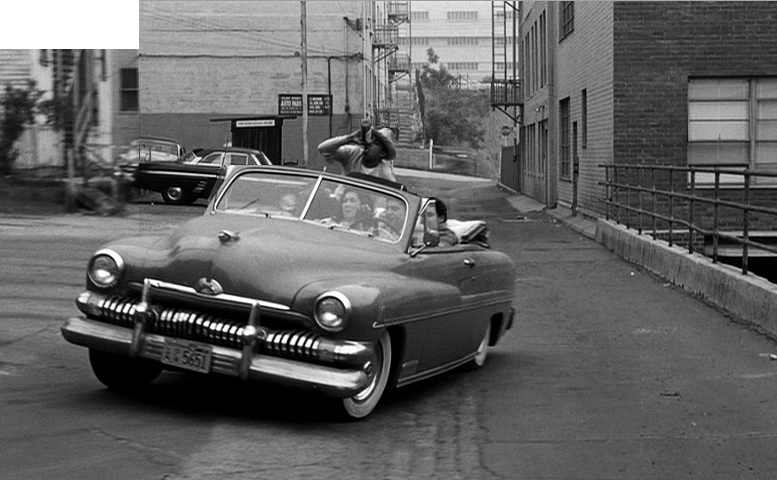 ... and here's another look in a scene from the 1955 film noir movie Kiss Me Deadly as Mickey Spillane's hard-boiled Mike Hammer approaches the Sunshine Apartments in his 1954 Corvette. Homer's wife Yvonne has spent the night with a friend at the Sunshine Apartments; awakened by the noisy shouts of the group, she watches impassively from the bedroom window as they stumble on by. Then ... Down towards the far end of Clay near 4th Street she sees them entering her place on the left at 334 Clay. ... a vintage photo ... this 1960s image offers a closer look at 334 Clay (on the left) as it was shortly before the houses were demolished.